Eternal Celtic Wedding Bands - Warrior Celtic Shield. Select Either 14K White Gold Center with 14K Yellow Gold Rims or 14K Yellow Gold Center with 14K White Gold Rims. 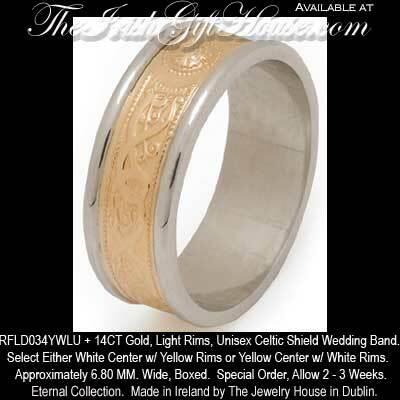 TJH - 14K Gold Ladies or Mens Warrior Celtic Shield Wedding Band. Light Weight Rims, Approximately 6.80 MM. Wide, Boxed.